“Love your neighbor as yourself”—this quality is our only goal, the spiritual sensation that is meant to fill all our desires. This means concern for the state of the world, for how much all people, all humanity, will advance toward a good state. And clearly, certain influences will seem good to them and certain—bad, and they might resist and refuse to accept us, or even look down on us like small children who don’t understand anything. After all, they think we have different views of the goal, of the future of the world. But this inner worry about the world must be alive in all our actions and thoughts, and it must guide us. If a person feels this concern, that means he is attuned correctly. And if he pursues various other goals and this concern or worry does not guide him, is not present inside, this is a sign that the intentions “Israel, the Torah, and the Creator” (a person aimed straight at the Creator, the Light of correction, and the Creator) do not connect within him. That is the only thing we act and study for. What are our qualities and how are they connected to the desire? After all, the will to enjoy is the only thing we have. First of all, it varies in might (P). But is there another parameter by which we can measure it? Yes, there is: It’s the limit (H). Besides different degrees of might, it also divides into different degrees of limitation. Initially none of my desires are limited. But when I take one desire and begin imposing a restriction on it, the form that emerges gives me a certain quality. Thus, every quality is created from a specific restriction on the force of a certain desire. My desires are distributed along the scale of might, but that’s not enough: Precisely their limitation creates forms or qualities in me. Let’s imagine our totality in the form of one large crystal that consists of many small crystals. The Surrounding Light pours upon this crystal. How does it penetrate inside and reach every little crystal? How does it expand and spread among them? How does it fill the general structure? Everyone participates in this: Every part limits the others, every one forms the friend and passes the Light to him, and every one receives Light from the friend after it passes through the others. 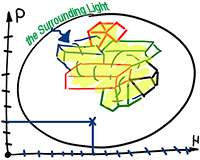 Maybe the example of a crystal structure will make it easier to understand how the Light passes through everyone and flows through all the axes. This is determined by the total, mutual correspondence of our qualities. Obviously, every little crystal has its own inner structure. We cannot change it, but we can deform it and distort the connection. Then we will need a long time for correction. That means the only thing the world needs is an optimization of the connection between people. Our connection is the most important thing, which is why we constantly urge people to unite above all the differences. In reality, all my qualities precisely correspond to the quality of all the others, being an irreplaceable segment of the common system. Therefore, we cannot try to change anything about a person, suppress any part of him, cut off any part, or on the contrary—try to make him grow something extra. We must only make sure that he develops in the right interconnection with others, while everything is tacitly preserved in him until the right time. Therefore, we don’t touch a person’s spiritual facets. Despair, exhilaration, confusion—no matter what takes over him, we only offer general support, wrapping him in warmth, while unchangeably abiding by the principle, “raise a boy in his way.” After all, all of one’s qualities conform to the totality of humanity, and if anything in him is harmed, the entire system is harmed. This is a very important aspect in upbringing. We have a desire and a thought. If we only had a desire, we would perform everything blindly with no self-control, just like inanimate, vegetative, and animate nature in which the only thought is how to fulfill the desire. A person who has developed to the inanimate, vegetative, and the animate levels thinks only about how to attain what he wants. There are different types of people: smart, energetic, violent, shy, brave, etc.—but each one wants to fulfill his desires, from a tiny baby to an elderly person who hides his desires. In each one there is the thought of how to fulfill his desire in every possible way. This is how we develop in feeling and in mind, like a beast, until the point in the heart is revealed in us and begins to ask: What is all this for? Why? From that moment on, real science begins; when I begin to ask about the essence of my desire: What do I need it for? This isn’t simple. People come to study, they become a group, but years may pass until they begin to ask this question, that is, that they want to know the desires they feel: where they come from? They begin to look for the reason, the root, the source. Then they understand that the thought was given to them in order to reach the Creator by studying their desires. If I, through thought, correctly perceive the desires, I can reach the source from which they come, will understand who is sending them and why, what he wants from me, and how I should regard Him. Through the group and even directly, I begin to demand from Him to change my desire: “You gave me such a desire, but I am asking for another desire!” then I will really be able to change it. The thought is given to us so that thanks to it we will be able to know our desires and demand new desires. The thought exists so that I can check and prove to myself that I can’t do anything with my desires! Even when I seem to overcome, it isn’t that but simply changing one desire for another, which is also egotistic: for respect, for control, and pride. I simply find another desire that beats the first one and change values. As a result of my thoughts, or under the influence of the environment, I begin to imagine that another desire is more important than the one I just had. And so I decide to change it to another. It is the game of egoism. This way I can change any desire I have. But I can truly change the desire only with the influence of the environment that will give me other values. Then, as a result of its influence, I will demand from the Creator to change my desires. These desires can already be super-natural for me, meaning against my ego. Since our relationship towards the world and life will completely change, then all of man’s resources—the mind and the heart, desires and thoughts— besides the bare necessity for the existence of his physical body will be thrown out in order to reach harmony with nature. And then we will fully understand its initial plan, its flow, its highest thought, and we will rise to the same level accordingly, meaning, a level higher than birth and death. We only need to picture what we are talking about. Since if I get to know the whole of nature, then I get to know such a level of it from where I will be looking at myself like at a small temporary element. However, I am already looking from another level, since I rise higher than myself, so to speak. Here, man finds absolutely clear answers to the questions about the meaning of life, existence. Naturally, this influences his mentality, behavior, and his cultural, social, and public relations. He sees the world and himself differently. He begins to think not based on temporary, defective points of view: I am here today and tomorrow I am not, so if I won’t be here anymore, what do I do? We can’t even imagine the huge change that happens inside of us, when we begin to see ourselves existing on the infinite time axis. Then, we perceive our body as an accompanying animal. Inside of us, such a psychological system begins to develop that changes at the root how we relate to others, to ourselves, and towards the world, and so I already begin to relate towards myself and to others from an eternal position. And this changes me completely, raises me, and makes me a serious, man of the world. How Do You Understand A Japanese Person? Question: If the correction has to be an internal one, why do we take all these external actions hoping to achieve internal changes through them? Answer: This is exactly where the difference lay; we want to use external actions (those recommended by the Kabbalists) in order to achieve the decisive point where we start demanding the Light of correction because we will understand that nothing will help us if not for the Creator. And we have to achieve this point as quickly as possible. And the most effective thing to become sure of one’s inability to do anything on their own and their lack of desire is to try and include themselves in a group. Then you will quickly reveal that you’re not worth a penny, you can’t overcome yourself, you push your friends away from you and are proud of this, hiding the truth from yourself. Try to look at yourself from the outside and you’ll see all the ways in which you avoid internal connection with the group. But, at the same time, if you’re attached to your friends, you’ll understand that you can’t go on like this! You must be together with them, at least in order to reveal the spiritual world with egoistic intentions. And you can’t get closer to them, so what is there to do? And then you start shouting so that the society and the Light would influence you, the more the better! You demand this egoistically, one hundred percent for yourself, Lo Lishma. The Light keeps working and working on you, sometimes more, sometimes less, altering your states, and you start valuing closeness with the group, connection, and development. You start noticing a correlation between the states of enthusiasm and the connection with the friends. You watch parts of the convention and you’re full of feelings. Because you already have this readiness, this is already close to you, you put a lot into it and you understand what attracts all these people. You feel their hearts. Maybe each person’s individual desire is small, but together we achieve huge power that impresses everyone. By these actions we arrive at two conclusions. First, I really want to reveal the spiritual world: Give it to me! I want it egoistically, who wouldn’t want to exchange this hell for heavenly paradise? Second, I understand that I cannot do this without a connection with the friends, inside which I can reveal the thing I want so much. That unattainable place I hate so much is where the treasure is hidden. So what do I do? I have to enter the dungeon; there is a lion at its entrance and at the bottom of it there is a treasure chest. I cannot avoid this lion! But this treasure is everything to me! How do I beat the lion? I get closer and it’s about to attack and eat me. He can’t break free from his chains; otherwise, he would have already swallowed me. But when I approach him, he suddenly gets up and takes me straight to the treasure chest…. We need to learn the system of laws that exist. This is because none of our desires, none of our actions and none of our thoughts are beyond the boundaries of this system. Its network reaches every cell in our body, every atom, and every particle, and ties them all on different levels and stages, whether they are biological tissues, physiological organs, the nervous system, thoughts, desires, lights, vessels and everything else. We have been given the feeling of imbalance. This imbalance between us and the right and real way to act was given to us on purpose, so that we will advance and learn to balance ourselves with the demands of the general network. Thanks to this, we begin to know who operates it. He seems to create a malfunction in the balance and we feel bad. Thus he invites us to contact Him: “Just ask, so that I will show you how to create the balance.” If we ask, our request is the vessel in which His action is later revealed, meaning the Light that completes the imbalance. The process is carried out in the following way: First a certain part is revealed in my vessel and I feel bad: diseases, troubles, problems, etc. By themselves they don’t mean anything yet, but then I discover the point in the heart, and I understand that there is an external reason for all my troubles. This raises in me the question about the meaning of life. So I begin to receive the filling from Him, and this is called “the Lord’s work.” Eventually He fills this part in me and it is corrected. So at first I felt the evil, and then I gave it a different meaning and filled it with goodness, with the Creator. Thus I reach a balance with Him: He performed the work according to my request. Then another corrupt part of the vessel is revealed to me, bigger than the previous one. Here I feel an even greater evil and discover a much stronger point in the heart. Accordingly, the group also seems much higher than before and the Creator much greater. He influences me much more intensely, and again after having discovered all the necessary means, I complete the balance. And so time after time, instead of my egotistic nature, I bring the Creator inside me. I learn His actions and by them, I attain Him, reach adhesion with Him, and more. These corrections take place from the lighter to the more serious ones, from the coarseness of the root level, Shoresh, until the fourth level of coarseness. They are also called the “worlds.” Thus I attain the worlds of Assiya, Yetzira, Beria, Atzilut, and Adam Kadmon (A”K). Eventually, my whole vessel is corrected and instead of the initial egoism, the world of Ein Sof fills me. So we must constantly pay attention to how balanced we are with nature. The imbalance reveals the evil inside me, which I have to complete in order to acquire the good. This is the only way to advance, to find my way no matter what. Today, when we come across problems and troubles, we have to understand that the crisis, the bad feeling, is a wonderful and special phenomenon by which we can correct ourselves. We must only turn to the group, to all those who feel the same evil. They must connect among them as much as they can, and find the power of unity inside. The general population find the power of unity without the Creator, but simply thanks to our unity. All the rest comes to them through us. Then we all reach correction together. So we must accept all the bad things that are revealed in the world as an invitation to develop. We must always move towards a greater union with others. A person is created especially in such a form that only the unity gives him the answers to all the troubles, even the most inner and personal ones. Only the unity can heal us. To Change The Upper One Or To Transform Oneself? Question: People populating the planet Earth have different systems of consciousness. The Europeans, for example, have a so-called vertical consciousness, while the Japanese have a horizontal one. How deep do I have to go into this? Do I have to learn to understand the Japanese, or is it enough for me to understand the people who surround me? Answer: This doesn’t matter at all! I don’t intend to look at the world through the eyes of a Japanese or a Chinese, a Ukrainian or an African. I am not interested in that. The main thing that interests me is to change myself, so that any foreign opinions, desires, and thoughts, would be accepted and absorbed inside of me exactly the same way as my own would. That’s it. And it is not important what kind they are! Let’s say that I have a child born from a Japanese woman. I see that he has some kind of a specific system of perceiving the world, a point of view toward the world. Well, so what, do I have to push him so that he necessarily accepts my system?! It is impossible! Different perceptions of the world are the result of a specific switch of brain functions, which has developed and evolved into such a system, which today cannot be destroyed. The whole of our integral education methodology is based solely on self-knowledge and in no way on suppressing yourself or others! By the means of suppressing, we completely switch ourselves off from the correct evolutionary movement forward towards harmony with nature. Nature does not stand for it! It seems to us that nature is forcing us, but this is only done so that we would voluntarily make the first move by ourselves. And it will keep forcing us until we find this kind will and we make the first step. However, nature does not show us what step we have to make. That is why I must try by all of the methods possible to develop my son. As it is said in the Bible: “Educate your child according to his ways”, meaning, according to his inclinations and internal potential given to him by nature. All our work can be summed up as clarifications and thought by which we come to the Creator and try to demand from Him new desires that are totally unsuitable for our ego, our nature. So I check how I am managed from Above, and I can feel to some extent this operating force. From the side, I analyze the actions of the Creator in me that motivate me. Thus, I begin to see the source, His actions—that is, me, and the power that controls me—and understanding how it works. These three components: an appeal to the Creator, the source, His action inside me, and its result—are all called the Creator’s work, because it is the Creator who does it. My participation is only in asking Him to perform this work. In this way, we become partners. As a result, from a small beast that performs actions blindly, who doesn’t even understand that it is being managed and thinks that it lives freely, whichever way it feels like—I become an active assistant manager, and so I reach adhesion with Him. I understand my desirable development and its final form and try to promote this plan even before it is fulfilled by the Creator. I order my development, and this is called “hastening time,” instead of the natural flow (in its time). This is how I attain it, by the power of thought, and I begin to walk hand in hand with the Creator in every step, and try to learn and to accelerate my development. As Baal Hasulam says in his article “Thou Hast Hemmed Me In Behind and Before“: the movement of the horse becomes one with the movement of the rider and this is their adhesion. The Creator waits for me to ask Him and helps me by evoking me and shows me by sufferings or by other clues the places where I have to pay attention to His leadership. And so we advance until full adhesion. All the changes that happen in the universe, following the origin of the plan of creation, only pertain to the creatures. But the Creator is constant, as it is written: “I did not change the manifestation of my HaVaYaH.” Nothing else happens in relation to Him: He wished to make a creature to please it—and He did it. All the actions take place inside the creature—in its consciousness, understanding, perception, and development. This way the creature develops from one point, which essentially separates it from the Creator. It is a special point, created by the Creator, which is the reason the created is called a creature, a desire. Everything beside this point must absolutely be like the Creator. 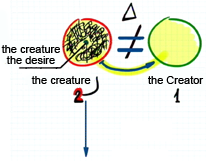 And in order to bring them to this similarity and create a connection between the creation and the Creator, the creature separates into an enormous number of parts. These parts are separated and are pushed away from each other by their egoism, the desire to enjoy, the evil inclination, a selfish intention. This is the way the creature feels: divided and diverse, separated into many different systems, which are hostile to one another. But all this only exists within the creature in its sensations. This sensation is called “concealment” (Alama)—an entire system of worlds (Olam), which exists so the creature would finally understand that the concealment separates it from the Creator. There is absolute perfection, unanimity in the Creator. He is one, and there are no differences within Him. But inside the creature there are an infinite number of different parts, which contradict one another. In the end, the creature discovers that this exact division does not let it connect with the Creator and creates inequality between them. This evokes a special feeling, called shame—the feeling of their difference, which makes the creature begin to act, striving to become like the Creator. And here it sees that for this it needs to unite with everyone it now hates, pushes away, neglects, and does not take into consideration. The creature is ready to make this transition, these actions of correction, for the sake of attaining equality with the Creator—anything to achieve adhesion. Complete equality of actions and qualities is called adhesion. This is a gradual, step-by-step process where we realize the program of creation. We must feel ourselves in all the other states on the way towards unity or when already attaining it—in other words, on all the rungs of the ladder, while increasingly developing our unity. At the end, we will see ourselves to be absolutely different creatures, and the group will appear different, not just a union of friends in a team, but a new spiritual formation with common thoughts and desires in a different reality. But any new state is directed towards the attainment of a greater connection, which is referred to as a union of friends both in our and the spiritual world.